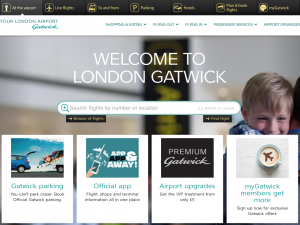 To create a customer-friendly website which supports airport guests and works well on mobile – while maximising retail opportunities for the client – demanded a radical re-think of existing content and navigation patterns. 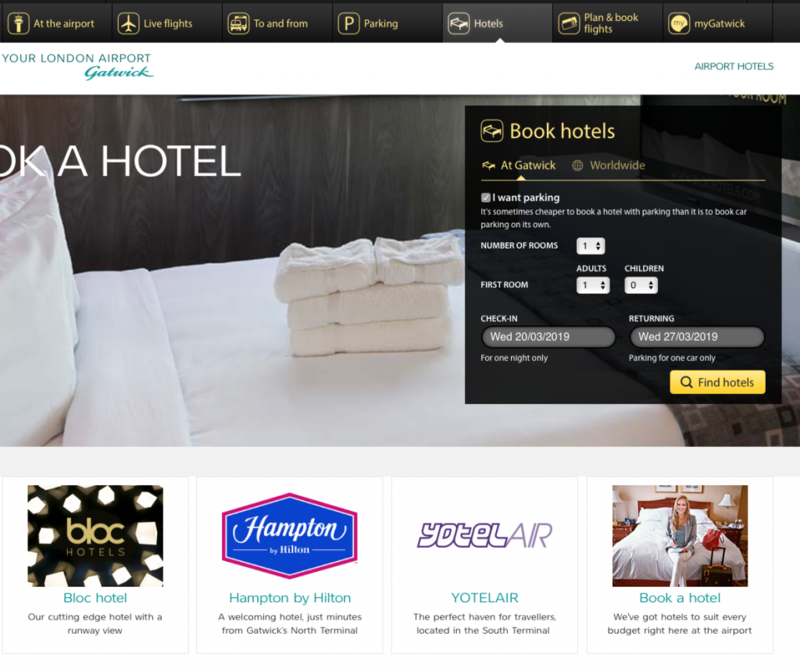 Menus, and other navigation elements, are of course an essential component of any interactive product. But you can’t improve the information architecture and navigation of a site just by changing the menus: you need to get close to the content itself, and to the people who will use it. Sometimes a site can contain a lot of good content – in that it is accurate, and complete – but the site itself is difficult to use, or does not do the things its owners want. In “Letting Go of the Words”, Ginny Redish talks about the elements of good content strategy: personas, governance, organising content, conversations and finding marketing moments. 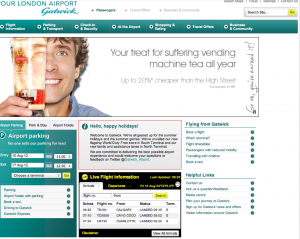 Those concepts influenced my contribution to Gatwick Airport’s redesign project. 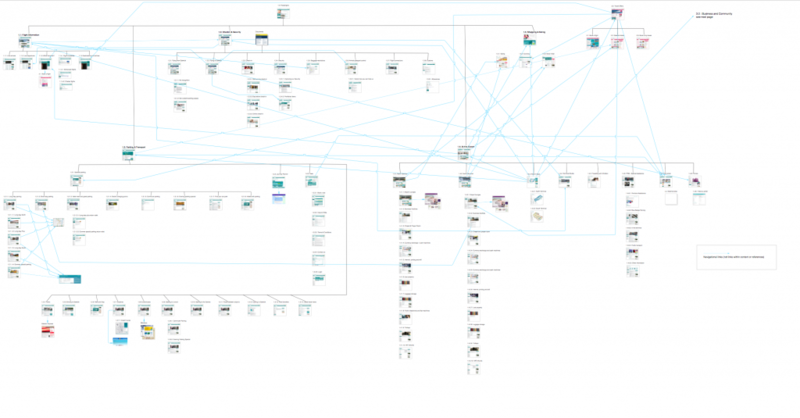 To make sense of the ‘digital soup’, and to make the homepage work much harder while feeling much easier to use, I did a deep re-organisation of the content around user goals, motivations, behaviours and anxieties. I did research with travellers at the airport and explored ways to make the whole experience more enjoyable for them. Design personas – researched archetypes drawn from real people – contextualised with user goals and stories – informed a task-oriented approach to organising content. A design persona telling the story of one key user. The persona work led to a further abstraction: no matter who you are, your physical journey at an airport is fundamentally the same as you go through departures or arrivals. With some variation of shopping or parking arrangements, all travellers go through the same security and boarding arrangements. This offered another organising principle of content to explore. Nearly everything you do at an airport, whether you’re going on holiday, a business trip, or you’re a taxi driver collecting a fare, starts with a flight number. 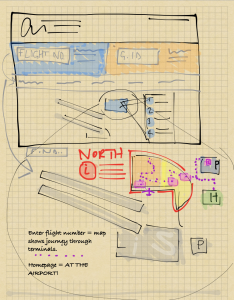 Early sketch exploring personalised content views based on flight number. But the flight number was just one entry point. Customers also needed to be able to browse a large quantity of information around parking and shopping, including booking flights. All of this e-commerce opportunity needed to be better-placed for the users, and the site made easier to browse generally. Exploratory level 1 navigation for an airport website. A simpler, but more interactive, approach to presenting content. Each of these approaches felt like it could be equally valid. But what would customers think, and how should we decide which routes to pick for further development? To find out, I built interactive prototypes. An advantage of working with an airport client is the large numbers of test participants with time on their hands. The client was very helpful in arranging visits to arrivals and departures, and finding airport guests to speak to and to run informal test-and-feedback sessions with. Speak to participants about their reason for being at the airport, their experiences so far, their level of engagement with the existing web site. Show them the new prototype and ask them to complete a task – ideally one they have already mentioned, or attempted. Ask them to think aloud. Use what’s said as a guide to further conversation and insight. Following this method we rapidly iterated on two or three potential design routes, picking a winner based on the qualitative feedback we received. 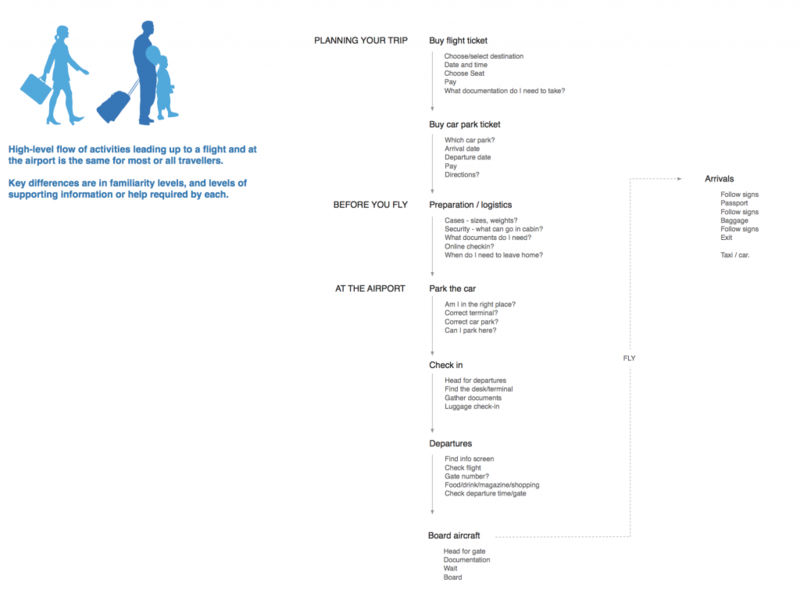 One page of a fully interactive prototype, used to prompt discussion with airport guests at arrivals and departures. A common misconception around user research is that sessions are designed to prove ideas are good. But that approach lends itself to confirmation bias. The idea is really to disprove ideas: ask test participants to complete tasks, and the things that don’t work for them come to the surface much more apparently than those that do. When this happens, questions can be asked that probe further, and those insights used to reflect upon whether the idea is fundamentally sound, but in need of improvement or a different execution – or just does not work at all. 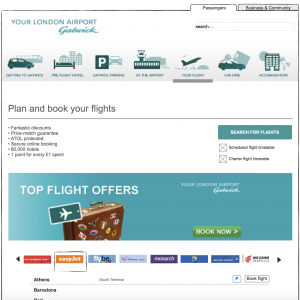 In this particular example, travellers consistently looked in the wrong place for the ‘At the Airport’ link, which was key to shopping and planning their time at the airport. The ‘temporal’ organisation was too unfamiliar a pattern for people who are more used to finding the ‘home’ link at top-left, the first member of level-1 navigation (not half way along as this approach had it). So we picked a more traditional navigation scheme for the final version. Early testing did reveal that one information design approach was working well: placing all major calls to action for booking hotels, taxis, flights and hire cars in the same place. This gave users considerably less work to do, and underpinned a simple and consistent presentation style for the content. 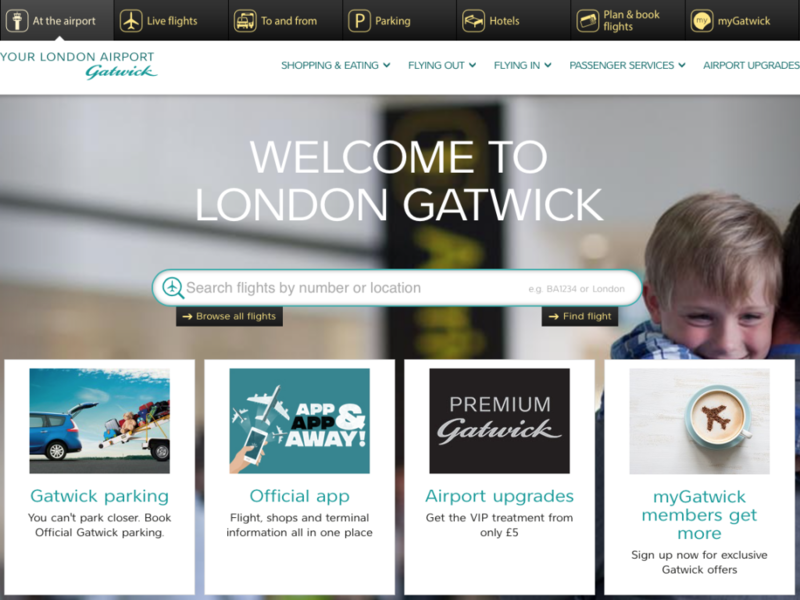 The above is just a snapshot of one aspect of the work done on Gatwick’s content to simplify it and make it more effective for users. 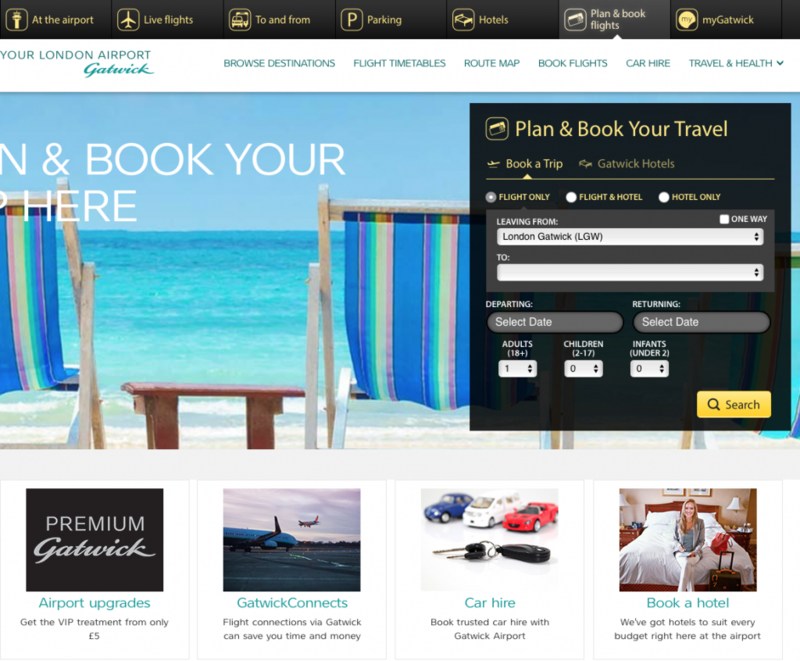 It shows the importance of information architecture and navigation, but that improvements to those aspects of a site do not come ‘out of nowhere’, and that to create effective organising principles usually involves deeper improvements to site structure and content. The user’s context is a good place to start when deciding what those changes should be, and that’s the approach I took on this project.